here are some “must” have add-on’s for the Microsoft Surface RT / Surface Pro Tablet, the none Microsoft component’s shown here are used by my own together with the Surface RT/Pro Tablet’s but i can not guarantee that similar none Microsoft components will work; you have to test this by your own. 1) Type or Touch Cover Keyboard, must have… Touch Cover is good for “smaller” Keyboard work but i do prefer the Type Cover for longer work. 2) Car charger, several Versions for the Surface RT (2A) /Pro (3,6A) are available at EBay starting at 17€ incl. Package. 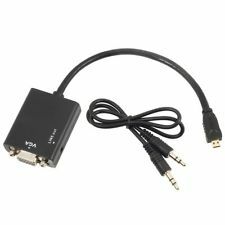 6) A Micro HDMI to VGA converter to connect a projector, available at EBay for less than 20€; look out for an Adapter incl. Audio (see picture). Surface RT only! 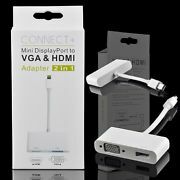 7) A Mini Display Port to VGA and HDMI converter, available at EBay for less than 20€, i recommend this one because it offers two connectors in one Adapter. Surface Pro only! 8) Optional: For the Surface Pro a USB 3.0 to Ethernet Adapter, around 20€ at EBay. 9) Optional: A (battery powered) Mini LED Projector like the Philips Pico Pix 2480 which is a really cool add-on for Presentations or Multimedia, starting at 270€ (Swiss prize). Like promised some time ago in my Samsung/Android article (Article) iam currently kicking out all android devices and this includes also my tablets. I’ve decided to go with the Microsoft Surface RT and Pro (not Surface 2) running Windows 8.1 for a simple reason, there where sold in Switzerland for a very very good prize (for example less than 250 € for the Surface RT 64 GB incl. Touch Cover Keyboard and a 50CHF Windows Store Voucher) and Apple is not realy an alternative for me. So what are the reason why i’ve taken the Surface? 1) First of all Windows RT / 8.1 (Pro) is for me the best Tablet GUI ever been done, from my point of view no other OS can compare to it. Of course some people blaming that Office is not really Touch optimized but on the other side… Did these guys always tried to work with an large Excel sheet with Android or IOS? I don’t thing so because it’s mostly crap compared to Microsoft Office and i’ve tested a lot (Polar Office, Quick Office and other). I also recommend to get an Bluetooth Mouse, it’s really a good add-on for work. 2) The quality of the Surface RT / Pro tablets is very high and can be compared to other high end devices. 3) Very important for me: A native Microsoft Remote Desktop Services Client.. Android and also IOS can not compare with it, sorry but this is the truth. I can deal with all available RDP Features incl. USB device redirection. 4) The optional Keyboards (Touch / Type Cover, i got both) is a must have and both Keyboards are working great for me.. Using a OnScreen Keyboard for Emails or articles like this… No competition. 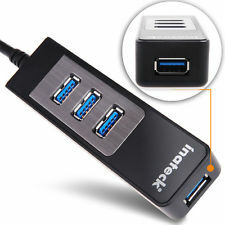 5) USB 2.0 / USB 3.0 Port (RT/Pro)… Connecting a external HDD/SDD or whatever is working like a charm but you should consider to get an external USB 3.0 Hub (Small one available @ Ebay for less than 25€) or a cheap USB 2.0 hub for the RT. For RT get a look on a RT compatible logo, x86/64 Bit Drivers will not work and a RT compatible Version must be available. For the Pro Version any Windows 8 compatible Device will work without any issue. 7) Mini Display Port (Pro) and Micro HDMI Port (RT) Ports to connect a projector or second Monitor, this is a great option and you can get adapters to VGA or HDMI very cheap on ebay (less then 20€). I never got issues with an “none” Microsoft adapter and they are much cheaper as the original ones but you should be aware that a 3rd Party Adapter might not work for you. 8) Very long use time for the Surface RT, in my tests i got more than 8 hours; the Surface Pro could be better but this will also work mostly 3-4 Hours for me; iam not sure what other people are doing with there device but i can’t blame the Surface for a short battery use time. 9) I can run all my Windows applications on the Pro tablet incl. the Hyper-V role, this is very important for me. No app store or similar nonsense… For RT a couple of “features” are missing for me but the most important ones (Archiver, Citrix Receiver and other Tools are available in the Windows Store for free or not much money). One con here is that the Windows Store do not contain a lot of Apps… To be honest, i don’t need 1000 times the same type of app; one good one is enough for me and the App amount is still growing. One Tip… Look out for Project Siena (Beta) from Microsoft, this will allow you to create simple business apps very fast for your company or your demands (http://www.microsoft.com/en-us/projectsiena/default.aspx); nothing similar for Android or IOS is available. 10) No “3rd Party” Vendor Update mess, i don’t have to deal with Samsung or Apple and i got the same patch Level on all my devices incl. Office at the same Time “Hurray!”. No feature difference, no “Mobile Providers” which have to “agree” to an update and this is really the important feature for me. 11) Printer support, for the Surface Pro no deal and also for the RT currently all my printers are working fine thru network and USB port. Try to print from an Android to IOS device… Funny thing right? …and if you got it to work (somehow), try to print out a larger document or presentation; do it look like the orginal Document? 12) Features for Office are similar to my Laptops/Desktop/Server System’s, Windows Store Apps are similar between Desktop/Laptops and Tablets (incl. one License/paid App for multiple Devices). Why getting (buying) the same type of app several times for different Operating System’s? Did you already thing about this?